Providing a holistic experience for football fans and online followers is an undertaking that football clubs tackle at various levels of the value chain with various degrees of success. The advent of the Internet and the social web, with the introduction of mobile and live-streaming technologies, gave football brands a new outlet to enhance the brand experience for their fans and followers. This post will look at how the experience economy proposed by Pine and Gilmore (1998) can be applied to the Periscope efforts of a football club. 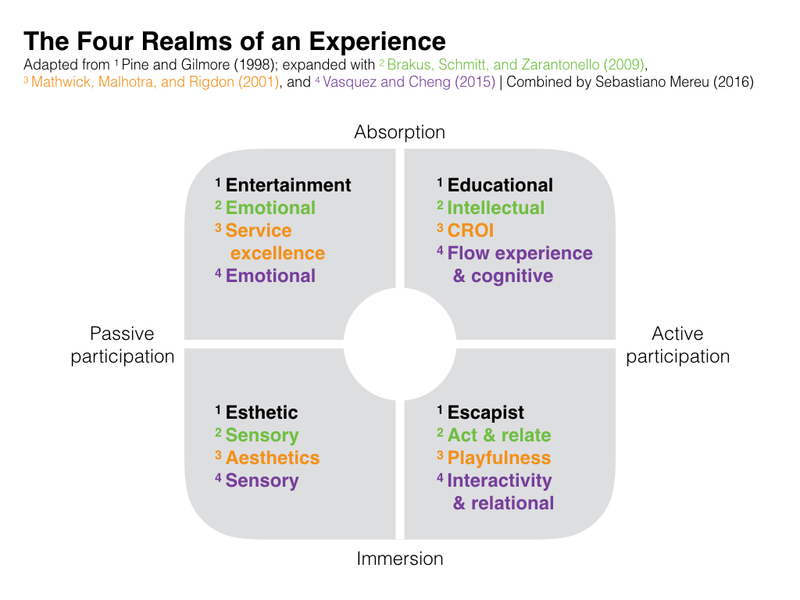 First, the article discusses the two dimensions (participation and environment) of the experience economy and the resulting four realms (entertainment, educational, esthetic, and escapist) of a brand experience. Secondly, the article proposes Periscope tactics for a football club to implement in the respective realms. Click to enlarge | The Four Realms of an Experience. We will focus on the keyword ‘experience’ from the statements above. Same and Larimo (2012, p. 481) documented the literature of the marketing/brand experience continuum and note that ‘Despite the frequent use by scholars of the term ‘experience’, its definitions in the literature tend to focus on different elements’. Albeit the lack of consistency in definition, parallels can be identified in the proposed models (see i.e., Pine and Gilmore, 1998; Brakus, Schmitt, and Zarantonello, 2009; Mathwick, Malhotra, Rigdon, 2001; Cheung and Vasquez, 2015). Given that ‘Experience marketing is generally based on experience economy theory [by Pine and Gilmore] (Same and Larimo, 2012: 482)’, this post will use Pine and Gilmore’s model (1998) as foundation for a tactical framework that can be used for experiential marketing of a football club on Periscope. Even though Brakus, Schmitt, and Zarantonello assert that ‘Pine and Gilmore’s framework is limited to retail settings and events’ (2008, p. 54), Sutera hints toward an opportunity to apply brand experience models to new media channels by stating, ‘social media will become an even more important component of sports spectatorship and mediated sports fan participation in the near future’ (2013, p. 177). Pine and Gilmore (1998) depict experiences in two dimensions: 1) Active and passive customer participation, 2) connection/environmental relationship uniting customers with the happening. Holbrook and Hirschman (1982, p. 132) point toward the same dimensions as Pine and Gilmore (1998) by stating that ‘various environmental and consumer inputs (products, resources) are processed by an intervening response system (cognition-affect-behavior) that generates output consequences which, when appraised against criteria, result in a learning feedback loop.’ Similarly, Mathwick, Malhotra, and Rigdon (2001) prove the viability of the Pine and Gilmore model (1998) by basing their ‘Typology of experiential value’ on the participation and environment dimensions. In regard to the participatory culture of the twenty-first century, Jenkins (2006, p. 3) explains, ‘Rather than talking about media producers and consumers as occupying separate roles, we might now see them as participants who interact with each other according to a new set of rules’. Sanderson (2011, p. 2) underlines Jenkins view by quoting Song and Deuze and stating, ‘Scholars have suggested that that Web 2.0 sites are “driven by social connections and user participation” (Song, 2010, p. 249), and have created a new Internet generation characterized by digital content creation and interactivity (Deuze, 2006).’ Furthermore, Goldsmith (2013, p. 52) claims, ‘Convergence and digitization have undoubtedly broadened participation in media production, and allowed content that could once only be seen on broadcast television to be accessed on multiple platforms, devices and services.’ This can be considered prove that new media is a viable channel to be used in the participation dimension of the experience economy. focus on effects attributable to the syntactic aspects of message content, that is, their structure and style. the Web offers a multitude of options for marketers of spectator sports, such as audio streaming, video streaming, social networking sites, and podcasts, which all have applications that are too meaningful to ignore (Fullerton, 2010: 588). Drawing both dimensions on a chart results into a model with four quadrants, or realms. Pine and Gilmore (1998, p. 102) use their experience theory model to explain four experience categories ‘according to were they fall along the spectra of the two dimensions’: entertainment, educational, esthetic, and escapist. Brakus, Schmitt, and Zarantonello (2009, p. 65) demonstrate that ‘brand experience can be broken down into four dimensions (sensory, affective, intellectual, and behavioral), which are differentially evoked by various brands’ and can be paralleled to Pine and Gilmore’s four realms. The same is the case for the proposed models by Mathwick, Malhotra, and Rigdon (2001) and Cheung and Vasquez (2015). This section will further discuss the four realms and sketch their possible application for the Periscope channel a football club. According to Pine and Gilmore (1998: 102), ‘The kinds of experiences most people think of as entertainment – watching television, attending a concert – tend to be those in which customers participate more passively than actively; their connection with the event is more likely one of absorption than of immersion’. Mathwick, Malhotra, and Rigdon (2001, p. 42) mention Holbrook & Corfman (1985) and Holbrook (1994) and describe the entertainment quadrant as reflecting ‘an inherently reactive response in which the consumer comes to admire a marketing entity for its capacity to serve as a means to a self-oriented end’. This means that a live-video broadcast on Periscope can be considered entertainment, when a viewer stays an absorbed and passive viewer instead of actively participating and becoming an immersed participant. Brakus, Schmitt, and Zarantonello (2009, p. 52-53) note that ’The product experience can be direct when there is physical contact with the product (Hoch and Ha 1986) or indirect when a product is presented virtually or in an advertisement (Hoch and Ha 1986; Kempf and Smith 1998).’ In the case of live-video broadcasting, and given the virtual attributes of such platforms, the product experience will strictly be indirect. Cheung and Vasquez (2015) hint towards the pleasure and arousal (P-A) model by Mehrabian and Russell (1974) and agree with Kim and Lennon (2010), who exemplify that entertainment can provide feelings of pleasure and relate to satisfaction, happiness and relaxation, whilst feelings of arousal can be described as frenzied, jittery, or excited. If a football club wishes to focus on creating a solely entertaining brand experience, the club can create content that focuses on viewer absorption and passive participation. This entails content that is easy to digest – so to speak –, such as situation footage from the tunnel or the hotel before or after the game, from the warm up on the pitch, from fans on the stands, or from the atmosphere outside and around the stadium. The goal is to provide viewers with video content that does not request or incite behaviour other than looking at the screen and enjoying the high-level entertainment. Pine and Gilmore (1998: 102) describe, ‘Educational events – attending a class, taking a ski lesson – tend to involve more active participation, but students (customers, if you will) are still more outside the event than immersed in the action’. Brakus, Schmitt, and Zarantonello (2009, p. 66) expect this ‘intellectual dimension to predict creative usages of the brand’, whereas Mathwick, Malhotra, and Rigdon (2001, p. 41) perceive it to reflect Consumer Return On Investment (CROI), which according to them, ‘comprises the active investment of financial, temporal, behavioral and psychological resources that potentially yield a return’. Additionally, Cheung and Vasquez (2015, p. 3) explain: “In online environments, the concept of Flow has been widely used to measure online users’ cognitive experiences. Flow is a concept that occurs in human-computer interactions and consumer behaviour (Kim, Suh, & Lee, 2013), and is a state when users are totally immersed in an online activity and forgetting what’s around them (van Noort, Voorveld, & van Reijmersdal, 2012).” Even though Cheung and Vasquez use the term ‘immersed’, they also connect the state of Flow to a cognitive experience, which entails the ‘activities of thinking, understanding, learning, and remembering’ (merriam-webster.com, retrieved 8 March 2016). Hence, our attribution to the intellectual/educational realm. 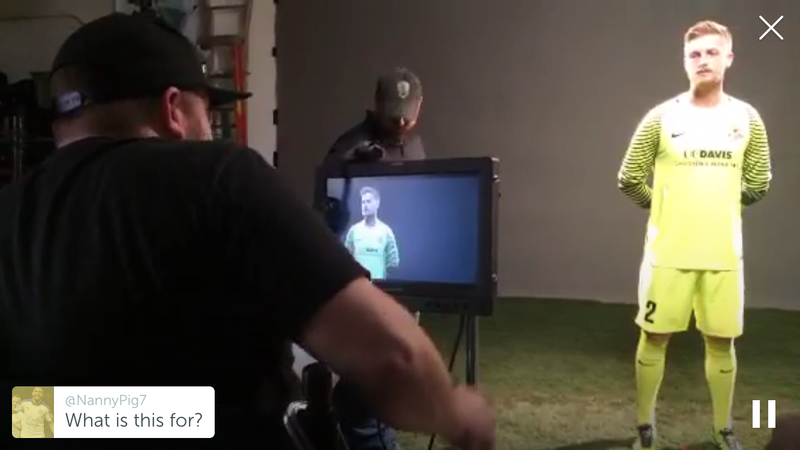 As we have mentioned before on this blog (see here), ‘wraparound sportv would include pre-recorded material in a television production setting, which is not viable for Periscope. 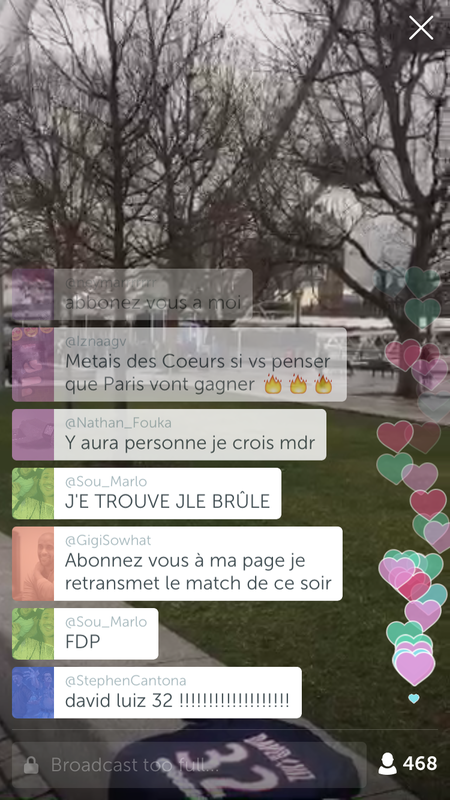 The above-mentioned content would have to be carefully organised, thoroughly structured, and exactly timed before the live-broadcast on Periscope to provide a high level of quality for the audience.’ Writing active intellectual participation from the audience – such as polls or other forms of quick and short responses – as an integral part of of the wraparound sportv broadcast is a crucial part of the segment. 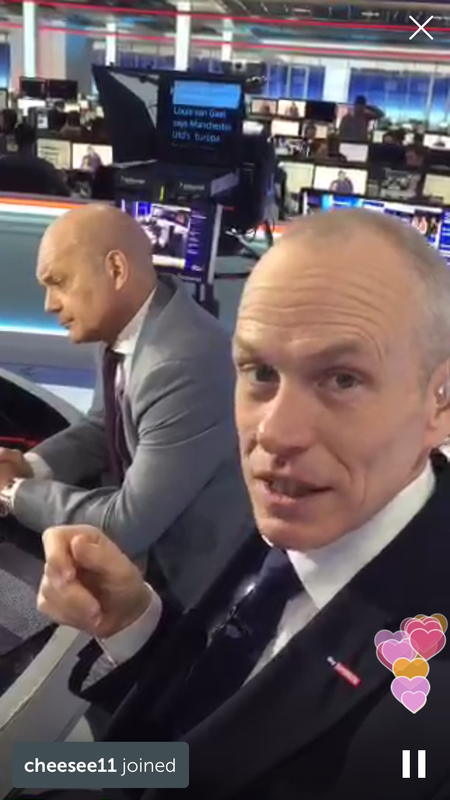 Such an educational segment seems to have a high potential to stimulate the intellect of a football club’s viewers, who might feel highly engaged and absorbed by the content, hence, experience a valuable return on their temporal, behavioral and psychological investment. Pine and Gilmore (1998, p. 102) explain that ‘Escapist experiences can teach just as well as educational events can, or amuse just as well as entertainment, but they involve greater customer immersion; acting in a play, playing in an orchestra, or descending the Grand Canyon involve both active participation and immersion in the experience’. On the basis of their theorizing, Brakus, Schmitt, and Zarantonello (2009, p. 66) predict specific actions and physiological reactions from customers when interacting with a brand in a deeply immersed behavioral experience with active participation. Mathwick, Malhotra, and Rigdon (2001, p. 44) mention Huizinga (1955) and Unger and Kernan (1983) and note, ‘Playful exchange behavior is reflected in the intrinsic enjoyment that comes from engaging in activities that are absorbing, to the point of offering an escape from the demands of the day-to-day world’; and continue by mentioning Day (1981), who states that ‘playful acts have a restorative capability and operate outside of immediate material interests’. Cheung and Vasquez (2015, p. 3) cite Pentane, Amialchuk, and Taylor (2011), who identify interactivity as a new component of online experience and add that ‘in online environments, relational experience is about socialising with others, and feeling a sense of belonging to a social group, or affirming particular values and lifestyles’. 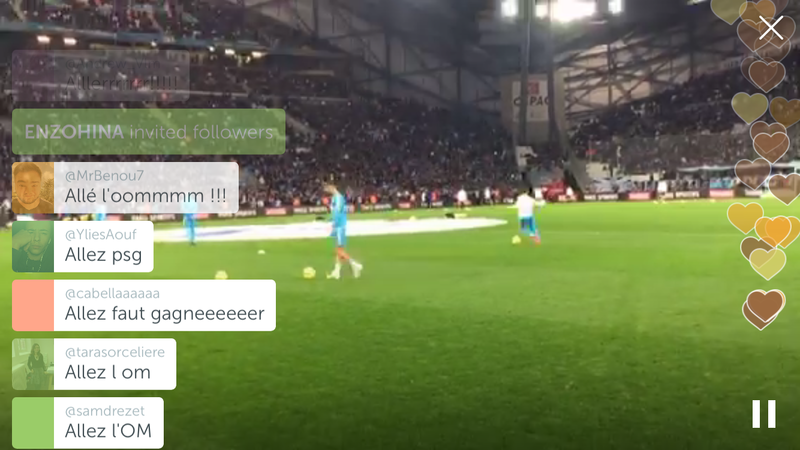 A football club can facilitate the engagement with its viewers on Periscope by requesting commentary and replying to that commentary live and direct. This can be done by setting up a traditional Q&A session with a player or a staff member. A further possibility is the panel sportv as proposed by Goldsmith (2009), which includes a panel of sports pundits, often current or former professional sports players, journalists and commentators, and often led or hosted by a sports journalist or other personality. In the case of a panel, the host would pick up questions from the viewers from the live commentary feed on the Periscope app and ask the panel to answer the questions. Sutera (2013, p. 66) underlines that ‘The open format of [a] show, which allows fans to contribute to the content through social media, along with the way the content is generated spontaneously during actual live broadcasts’, can increase the popularity of sports programs. Asking questions and having them answered in a live setting enables the viewer to become an active participant and immersed in the production of the brand experience. A synthesis of the four statements in the paragraph above leads to the conclusion that designing a visually appealing live-video broadcast is essential in the context of the aesthetic realm. A Google search on the adjective ‘aesthetic’ results in the definition, ‘concerned with beauty or the appreciation of beauty’ (retrieved 9 March 2016). Viewers will enjoy this segment for its astutely crafted audiovisuals. This entails producing a visually stimulating and appealing show with professional equipment. Periscope live-streams are produced with a cell phone, which often results in a) shaky camera movements, b) unfavourable light conditions and, c) sub-optimal audio quality. It is highly advisable to a) use a tripod or cell phone stand to give stability to the camera, b) use extra lights to enhance the light conditions, and c) use a professional microphone that plugs directly into the cell phone to enhance the audio quality of the broadcast. Examples where aesthetics play a crucial role in this context could be the broadcast of a highly visual celebration or introduction, a portrayal of the stadium, training ground or other venues, or any event or happening that relies on audiovisual aesthetics. The experience economy model shows untapped opportunities for football clubs, which seem to carry even more potential when combined with other models, as we did in this exercise. Pine and Gilmore (1998, p. 102) conclude that ‘the richest experiences encompass aspects of all four realms, forming a “sweet spot” around the area where the spectra meet’. Bridgewater (2010, p. 127) explains that the theme of a football brand experience should have ‘a “single voice” and [that] clubs might have a distinctive set of images and meaning which bring to life the particular experience’. Building upon the argument of Same and Larimo (2012, p. 485) that experiential marketing is ‘a tactical, rather than a strategic approach’ and ‘may consist of a single campaign or involve only one media channel’, it is advisable to explore all four realms of the brand experience on Periscope with pilots for all single experiences first and then conceptualise broadcasts that encompass all necessary attributes to find the “sweet spot”. The SporTV typology by Goldsmith (2009, 2013) can provide ideas for further research that can benefit from the expansion to live-video broadcasting (Periscope, Facebook Live, or Meerkat). An influential reference book was not (directly) considered in this post, Experiential Marketing: How to Get Customers to Sense, Feel, Think, Act, Relate (1999) by Bernd Schmitt. Even though Brakus, Schmitt, and Zarantonello (2009), Mathwick, Malhotra, and Rigdon (2001), and Cheung and Vazques (2015) considered Schmitt in their articles, it is recommendable to consult his work independently. Brakus, J., Schmitt, B. and Zarantonello, L. (2009). Brand Experience: What Is It? How Is It Measured? Does It Affect Loyalty?. Journal of Marketing, 73(May 2009), pp.52-68. Bridgewater, S. (2010). Football Brands. New York: Palgrave Macmillan. Cheung, J. and Vazques, D. (2015). An exploratory study to understand online consumers’ experiential responses towards fashion visual content. In: Academy of Marketing 2015: The Magic in Marketing. Limerick: University of Limerick. Day, H.I. (1981). Play, a Ludic Behavior, pp. 225–249 in Advances in Intrinsic Motivation and Aesthetics, New York and London: Plenum Press. Fullerton, S. (2010). Sports marketing. Boston: McGraw-Hill. Goggin, G. (2013) Sport and the Rise of Mobile Media. In ed. Hutchins and Rowe, Digital Media Sport: Technology, Power and Culture in the Network Society. Routledge. Goldsmith, B. (2009). Sportv: Beyond the Sport Event. [online] Flowjournal.org. Available at: http://www.flowjournal.org/2009/10/sportv-beyond-the-sport-event-ben-goldsmith-university-of-queensland/ [Accessed 8 Mar. 2016]. Goldsmith, B. (2013) “SporTV”: The Legacies and Power of Television. In ed. Hutchins and Rowe, Digital Media Sport: Technology, Power and Culture in the Network Society. Routledge. Guido, G., Capestro, M., and Peluso, A.M. (2007). Experimental analysis of consumer stimulation and motivational states in shopping experiences. International Journal of Market Research, 49(3), 365–387. Hoch, S.J., and Ha, Y.W. (1986). Consumer Learning: Advertising and the Ambiguity of Product Experience. Journal of Consumer Research, 13 (September), 221–33. Holbrook, M.B. and Corfman, K.P (1985). Quality and Value in the Consumption Experience: Phaedrus Rides Again, pp. 31–57 in Perceived Quality: How Consumers View Stores and Merchandise, Jacob Jacoby and Jerry C. Olson (Eds. ), Lexington, MA: Lexington Books. Holbrook, M. and Hirschman, E. (1982). The Experiential Aspects of Consumption: Consumer Fantasies, Feelings, and Fun. J CONSUM RES, 9(2), p.132. Huizinga, J. (1955). Homo ludens: A Study of the Play Element in Culture. Boston, MA: The Beacon Press. Kempf, D.S. and Smith, R.E. (1998). Consumer Processing of Product Trial and the Influence of Prior Advertising: A Structural Modeling Approach. Journal of Marketing Research, 35 (August), 325–38. Kim, H., and Lennon, S.J. (2010). E-atmosphere, emotional, cognitive, and behavioral responses. Journal of Fashion Marketing and Management, 14(3), 412–428. Mathwick, C., Malhotra, N. and Rigdon, E. (2001). Experiential value: conceptualization, measurement and application in the catalog and Internet shopping environment. Journal of Retailing, 77(1), pp.39-56. Mehrabian, A., and Russell, J.A. (1974). An Approach to Environmental Psychology. Cambridge, MA: MIT Press. Olson, J.C. (1981). What is an Esthetic Response? pp. 71–74 in Symbolic Consumer Behavior, Elizabeth C. Hirschman and Morris B. Holbrook, (Eds). Ann Arbor, NY: Association for Consumer Research. Pentina, I., Amialchuk, A., and Taylor, D.G. (2011). Exploring effects of online shopping experiences on browser satisfaction and e-tail performance. International Journal of Retail & Distribution Management, 39(10), 742–758. Pine, J. and Gilmore, J. (1998). Welcome To The Experience Economy. Harvard Business Review, pp.97-105. Same, S. and Larimo, J. (2012). Marketing theory: Experience marketing and experiential marketing. In: . Vilnius: Vilnius Gediminas Technical University, pp.480-487. Sanderson, J. (2011). It’s a Whole New Ballgame: How Social Media Is Changing Sports. New York, NY: Hampton Press. Spoelstra, J. (2001). Marekting Outrageously. Austin: Bard Press. Sutera, D. (2013). Sports Fans 2.0: How Fans Are Using Social Media to Get Closer to the Game. Lanham, Maryland: Scarecrow Press. Unger, L.S. and Kernan, J.B. (1983). On the Meaning of Leisure: An Investigation of Some Determinants of the Subjective Experience. Journal of Consumer Research, 9(March), 381–392. Van Noort, G., Voorveld, H.A.M., and van Reijmersdal, E.A. (2012). Interactivity in Brand Web Sites: Cognitive, Affective, and Behavioral Responses Explained by Consumers’ Online Flow Experience. Journal of Interactive Marketing, 26(4), 223–234. Veryzer, R.W. Jr (1993). Aesthetic Response and the Influence of Design Principles on Product Preferences, pp. 224–228 in Advances in Consumer Research, 20, Association for Consumer Research.